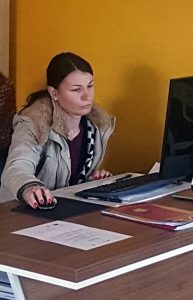 After more than three years of job searching, after successfully completed practical training for the profession “interior designer and woodworking technician”, Ms. Zorica Jotanović, young architect from Prnjavor started to work in the wood processing company Rizba on 12th February. She is the fifth out of 75 unemployed persons from Prnjavor who will be trained for work in metal, word-processing, food production and leather and footwear industry organised by the Partnership, and out of which 50 unemployed persons will be employed. “I am pleased that I had the opportunity to attend training which is very important for my job and which will be helpful for my future work. I am especially happy that after more than three years of job searching, I started to work in the company Rizba from Prnjavor ” stated Ms. Jotanović. Local partnership Prnjavor is one of 15 partnerships established in the country within the project “Support to Local Employment Partnerships in B&H”, funded by the EU with 4 million EUR and implemented by the International Labor Organization (ILO), which aims to re-qualify nearly 2,000 unemployed persons and employ at least 620 of them in 22 municipalities in BiH.